The 2018 regular season is in the books and the College Football Playoffs are set. 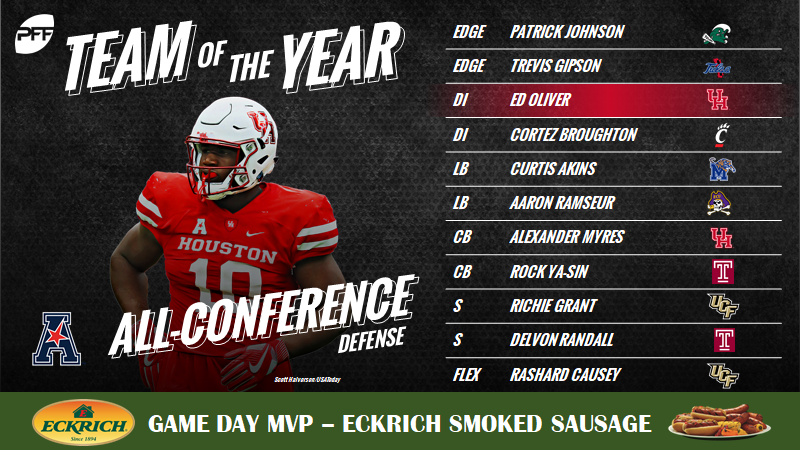 With the culmination of the regular season comes PFF’s awards and all-conference selections as well as our All-American lists for both the first and second team. The All-conference selections have been made by each of PFF’s leading conference analyst based mainly on PFF’s play-by-play grading process for the entire season as well as cumulative grades, game grades against quality opposition, other PFF advanced statistics and playing time. 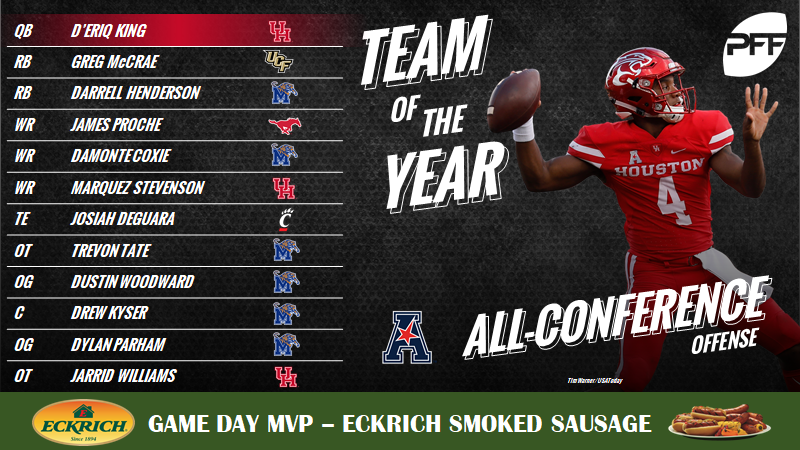 The All-AAC selections below are headlined by the first team with the second team listed below each position. King led the conference in overall grade as he was dominant on deep passes before his injury, completing 26 attempts targeted at least 20 yards downfield for 912 yards (first) and 12 touchdowns (second). McCrae ranked second behind Darrell Henderson in forced missed tackles per attempt (0.20) and yards after contact per attempt (4.5) among all qualifying AAC backs this season. Henderson led all AAC backs in forced missed tackles per attempt (0.26) and yards after contact per attempt (6.2), and he averaged an impressive 1.67 yards per route run in the passing game. Proche led all of his colleagues in total yards after the catch (555) this past season as he also led all AAC receivers in first-down receptions with 58. Coxie averaged 3.07 yards per route run on the year, ranking second behind just Tulsa’s Darnell Mooney in the AAC. Coxie also recorded 34 receptions of 15-plus yards, an AAC-high among wide receivers. Stevenson finished just behind Proche in total yards after the catch at 503 on the year, but he finished ahead of Proche in yards after the catch per reception (7.6). He forced 16 missed tackles after the catch this season to rank second. No AAC tight end ran more routes than Deguara, and he averaged an impressive 1.57 yards per route run and 12.6 yards per reception for the Bearcats in 2018. Tate was a beast in pass protection for the Tigers, as he led all AAC offensive tackles with 250-plus pass-block snaps in PFF’s pass-blocking efficiency (98.9). Woodard’s 98.8 pass-blocking efficiency at the season’s end ranked tied for third among qualifying AAC guards. He allowed just nine total pressures (only one sack) across his 405 pass-block snaps. He also earned the AAC’s best run-block grade among guards. Kyser’s 76.0 run-block grade led all qualifying AAC centers, and he earned a 98.3 pass-blocking efficiency on the year. Parham’s success came in the run game, as he finished second in run-block grade behind his teammate, Woodard, among qualifying AAC guards. Williams finished close behind Tate in PFF’s pass-blocking efficiency this past season, as he allowed just 12 total pressures across his 465 pass-blocking snaps and earned an impressive 98.5 pass-blocking efficiency. Johnson led all AAC edge defenders in total pressures (41) while he also limited receivers to just 48 yards on 74 snaps in which he dropped back in coverage. Gipson was a menace in run defense for Tulsa this season, recording a total of 37 defensive stops while he also accumulated 29 QB pressures on his 289 pass-rushes. Not much more can be said about Oliver who was his usual dominant self this season. He not only led all AAC interior defenders in grade, but he also led all defensive players in the conference with a 92.7 overall grade. Broughton turned a solid 2017 season into a massive 2018 campaign as he led AAC interior defensive linemen with 34 total QB pressures. Akins was good all over the field for the Tigers this year, especially when blitzing as he registered 11 QB pressures on just 29 pass-rushing snaps. On 238 snaps in coverage, Ramseur was targeted 12 times and limited receivers to just 41 total yards and a 64.9 passer rating on throws into his coverage. Stingy in coverage, Myres made 18 defensive stops and saw a passer rating when targeted of just 78.5. Ya-Sin broke out in 2018, finishing with the second-highest overall grade at cornerback. He was targeted 59 times as the primary coverage defender and made 10 plays on the ball (2 INT, 8 PBU), allowing a 63.1 passer rating. Grant was a player to watch in the AAC Championship game before it kicked off and he finished his season on a high note with a game-sealing interception. In total, he recorded six interceptions and four more pass breakups, allowing a 45.2 passer rating on throws into his primary coverage. Randall recorded 22 defensive stops and allowed less than 50.0% of passes thrown his way to be caught in 2018. Causey was tremendous all over the field for the Knights, recording a whopping six QB pressures on just 13 pass-rushing snaps while he also held opponents to under 50.0% catch rate on targeted throws. Verity was almost automatic in 2018, missing just a lone extra point and knocking home 90.0% of his field goals including his lone kick of 50-plus yards. Averaging the conference’s highest hangtime on punts, Smith recorded a ridiculous net punt average of 44.8, which was 5.2 yards further than the next conference punter. Sanders averaged a conference-best 28.1 yards per kick return and finished as the highest-graded kick returner in the process. Williams was our Second-Team All-American at punt returner as he gained a conference-high 310 yards on punt returns while averaging 11.1 yards per return without a muff this season.